How long until you can zoom in on yourself looking up? 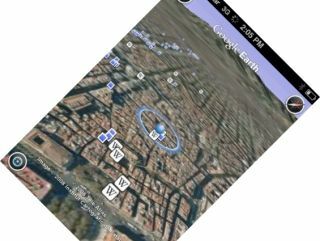 Google Earth is making its bow on the iPhone, bringing the virtual tour of the globe to Apple's popular handset. Although Google is part of the Open Handset Alliance that is developing Android, the search and advertising giant is showing no signs of easing back on its love of the iPhone App store. With confirmation that firmware update 2.2 will bring Google's Street View to the iPhone, people will now also have the option of looking at the planet from the heavens through a free downloadable app. "The idea of having Earth on a mobile device is something people dreamed of back to the Keyhole days and before," said Peter Birch, Google Earth's Product Manager. "This is the first opportunity we've had to be able to deliver a great experience." To operate the app, pinching the screen zooms in and twist turns the view, whilst the accelerometer means that twisting the screen also tilts the horizon. There is Wikipedia functionality and an option to find yourself, but don't expect street names – you'll just have to use in-built Google Maps for that. Google released an eponymous app for the iPhone back at launch, but many of its online services work perfectly through the browser, and Gmail users can have their email integrated into the phone's mail system. Google Earth is available for nothing right now – so you can zoom into random countries to your heart's content.